A close-up of the emergency crew return vehicle — or lifeboat — prototype for the International Space Station. 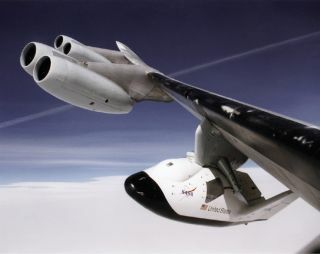 In this historical photo from the U.S. space agency, a unique, close-up view of the X-38 (Crew Return Vehicle) under the wing of NASA's B-52 mothership prior to launch of the lifting-body research vehicle is shown. The photo was taken in November 1997, from the observation window of the B-52 bomber as it banked in flight. The X-38 Crew Return Vehicle (CRV) research project is designed to develop the technology for a prototype emergency crew return vehicle or lifeboat for the International Space Station.